In the wealthy portion of the eternal city of Ka, there is a medium cemetery with a secret. Here, the great and ancient alchemist Hesthar is buried in a well-appointed crypt. Hesthar was twice honored as savior of the city for his acts saving the city from the oricsh hordes that descended from the mountains as well as his defeat of the foul dragon Stygothinax. Yet Hesthar was not content with a well lived life, for it was short. He craved a longer lifespan and in his waning years spent much of his treasure searching for the secrets to immortality. As his reached the end of his mortal coil, the final answer continued to elude him and so he took the dangerous step of deliberately becoming a vampire. Carefully planned, the poor vampire who infected him was quickly dispatched, leaving Hesthar free to continue his studies. He created this cemetery post-mortem and engaged the morticians and caretakers as his thralls. The cemetery caters to the wealthy and important, and is considered the finest and most beautiful in the eternal city. That the finery is all a front for Hesthar's bloodlust is well hidden. There are enough dying nobles that Hesthar is able to keep himself and his minions sated with the blood of the recently deceased. And so, for the moment, he is content to pursue his alchemical studies in secret. 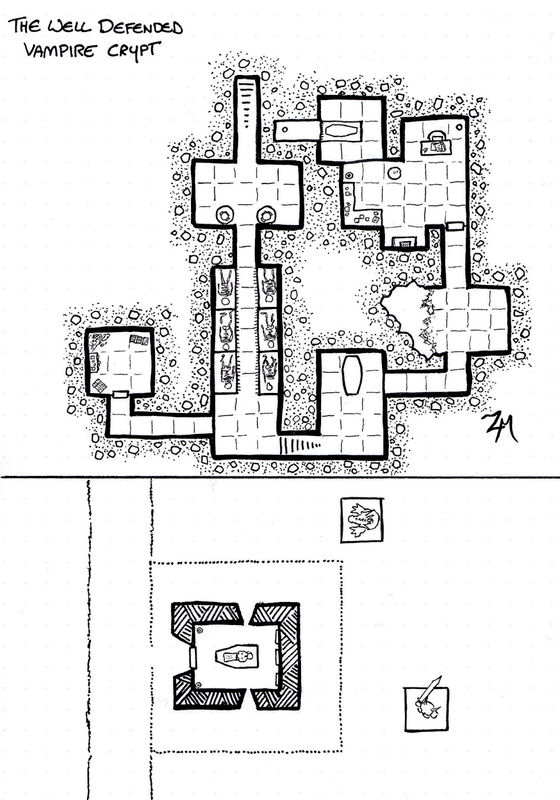 The Well-defended Vampire Crypt is a small map useful for any sort of urban cemetery setting. Encounters can be varied based on party level - the description that follows is only a rudimentary guideline. The crypt itself is a standard crypt with a stone sarcophagus in the middle. Along the eastern wall are three plaques which could be family memorials, testimonials or other noteworthy elements to the story. To the north of the crypt is the statue of a dragon – in particular the one which Hestar defeated. To the east is the statue of a giant orc representing his other great victory. On occasion smoke comes out of the nostrils from the statue of Dragon. This is smoke that originates in the fireplace of room 7. Opening the crypt reveals a narrow set of stairs leading down into darkness. 1. At the base of the stairs is a small, long room with two statues guarding the other entrance. These two statues are animated guardians which are triggered by opening the crypt in room 5. For high-level parties these could be stone golems; for low-level parties these could be animated objects. This room is completely unlit. Once awakened, the golems have orders to prevent anyone from leaving the crypt. 2. This room has niches with human skeletons laying in them. It is lit by small everburning torches which provide dim light throughout the room. These niches represent previous adventurers who tried to infiltrate the crypt. The names alongside the alcoves are fabricated to make it seem like extended relatives of Hesthar. The skeletons also wake up when the crypt in room 5 is disturbed. Once awakened, the skeletons actively seek out any intruders with intent to kill. 3. This room is located off a secret passage from room 4. It is unlit and the door is locked. Inside the room is Hesthar's treasury minus his most cherished magic items. Several of the items in this room are mildly cursed. These cursed items compel the user to retain possession of them while at the same time acting as a beacon for Hesthar to locate the looter. Hesthar’s strategy here is to give up some of his treasure in order to eliminate the looter at a later date and reclaim the lost treasure. 4. This room is empty. What light there is in this room comes from the alcoves in room 2. Along the west wall is a secret door with a passage connecting to room three. In the bottom right-hand corner our stairs going down to room five. 5. This room is well lit with everlasting torches from small nooks in the wall. In the center of the room along the north end is an elaborately carved wooden coffin. This coffin is designed to look exactly like a vampire’s coffin should with the intent to fool intruders. 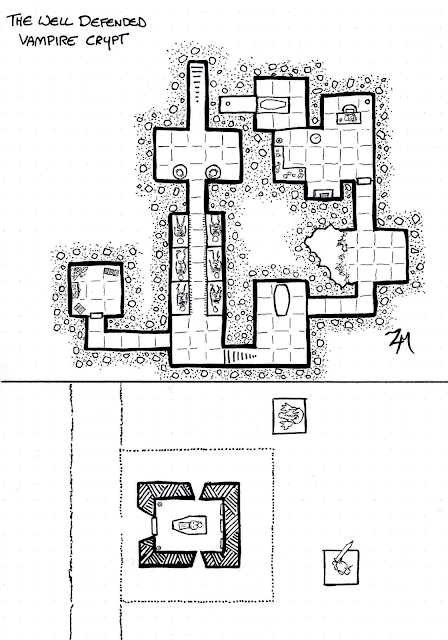 If a party adventurers listens at the coffin they would hear scraping sounds from within. If the party opens the coffin a ghoul or ghast immediately escapes and attacks the party. The ghoul is ravenously hungry and fights to the death. Opening the coffin also summons the six skeletons from room 2. The skeletons arrive in three rounds. There is also a secret door on the east side of room 5 which continues to room 6. This secret door is particularly difficult to find. 6. This room is unfinished and unlit. Hidden in the recesses of the left wall (which is all rubble) is a type of ooze or gelatinous cube. Hesthar uses this creature as a garbage receptacle for biological material that comes into his domain. This has helped to destroy all evidence of a vampire loose in the city. The door to area 7 is locked and difficult to unlock. 7. This room is well lit and Hesthar’s living quarters and laboratory. In the northeast corner is a cluttered desk with numerous writings and scrolls on it. Just northeast of the desk is a lit brazier. In the southwest corner is his laboratory workspace. Numerous potions and alchemical equipment litter the workspace. Due South is a fireplace which Hesthar uses for heating and alchemical experiments. In the center of the room to the north is a small table. Directly west and along the north wall of the small table is in other secret door leading to area 8. 8. This room is Hesthar’s private chambers. In here is his crypt. His crypt is on a raised dais with an alcove behind and due west of it. A small hole at the far end of the alcove leads upwards to the surface where a corresponding small hole exists in the windowsill on the north side of the crypt. This allows Hesthar to enter and leave his home without attracting attention or altering anything in areas 1-7. From artistic perspective there two things that I want to mention with this map. The first is that I’m still working on getting the process of digitizing line art down. I feel that this art is okay but that the original pen and ink still looks a lot better. I want to get that gap to be less each time I produce something. The other thing is the inclusion of the stone and gravel to indicate where there is rock. I rather like this affect and think I will use it more in the future. That’s pretty much about it. I hope you like the map and that the two versions (PC version and DM version) are helpful. I intentionally kept the encounters vague so this can be used across multiple platforms. Harmony - a medium sized town where I once lived.